Southern California’s urban forest and nursery industry are threatened by an infestation of an invasive beetle pest. In 2012, DNA analysis of beetles from an avocado tree in Los Angeles County determined that the insect was a new species. This beetle was named polyphagous shot hole borer (PSHB), although it still has to be described scientifically and given a species name (for now it is Euwallacea sp.). Since then, PSHB has been observed on a wide variety of trees common to urban landscapes and natural areas of Los Angeles, Orange, Riverside, and San Diego counties. What makes PSHB so dangerous is that it is the vector for a Fusarium fungus that causes a disease called Fusarium dieback, which is potentially fatal to susceptible host species (Editor’s note: See “Disease Focus” and Steve Tjosvold’s “Observations” in this issue for more information about this disease). This small beetle has attacked hundreds of different tree species (hence the name “polyphagous”), and so far, scientists have been unable to identify its method of host selection. 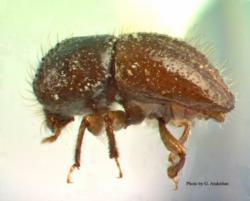 The beetle’s long host list includes over 110 tree species that are susceptible to Fusarium dieback. New reproductive hosts—tree species in which PSHB can cultivate the fungus and successfully produce offspring—continue to be discovered. For now, the list of 27 reproductive hosts includes avocado, box elder, castor bean, English oak, coast live oak, cork oak, Engelmann oak, valley oak, California sycamore, coral tree, red willow, weeping willow, sweet gum, Palo verde trees and several species of maple. Early infestations are very difficult to detect. The beetle itself is tiny: females are black in color and about 0.07 to 0.1 inch long (fig. 1), while the brown-colored males are smaller, at 0.05 inch long (fig. 2). Entry and exit holes of this beetle are a mere 0.033 inch in diameter. Luckily, some host trees respond with obvious gumming (e.g., goldenrain tree), bleeding (e.g., California sycamore), or white-sugar exudate (e.g., avocado) at the entry hole, but staining can be subtle, tricky to recognize, and differs greatly from host to host. Fig. 1. Female polyphagous shot hole borer (PSHB), Euwallacea sp. Photo by G. Arakelian. Only a few holes may be evident on a tree’s bark, but PSHB can bore a network of galleries from a single entrance. It is in these galleries that PSHB inoculates the host species with Fusarium and proceeds to farm the fungus in the tree’s living tissue (fig. 3). In reproductive hosts, females lay their eggs at the ends of the galleries. When the larvae hatch, they too will feed on the fungus. Brothers and sisters mate with each other (so that when females leave the gallery, they are already pregnant) and the mother may mate with her sons (so that she never needs to find a male when she travels). This means that this particular beetle species does not use pheromones for mating—and that pheromone trapping methods are not an option. Fig. 2. Male polyphagous shot hole borer (PSHB), Euwallacea sp. Photo by G. Arakelian. Researchers at the University of California, Riverside (UCR) are investigating PSHB/Fusarium biology and potential control methods, such as biological control and insecticide/fungicide treatments for the beetle and the fungal symbiont (funded by the California Avocado Commission). Drs. Akif Eskalen and Richard Stouthamer recently returned from Vietnam, the origin of the Los Angeles, Orange, Riverside and San Bernardino County infestations (Taiwan is the suspected origin of the infestation in San Diego County), where they searched for natural enemies. Fig. 3. 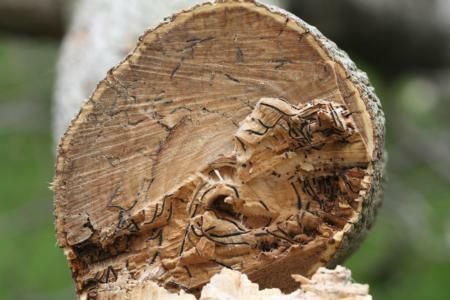 Cross section showing fungus-infested PSHB beetle galleries in a heavily infested box elder limb. Photo by J. Kabashima. While UCR works on developing potential control strategies, UC Cooperative Extension, Orange County is helping to conduct extensive field surveys for PSHB. This work, funded by Orange County Parks, mainly focuses on PSHB activity in County parks (approximately two dozen parks), but also addresses problems on other properties throughout Orange County where we receive requests for monitoring assistance. The goal of the survey is to track the extent of PSHB activity and monitor the progression of the infestation. Using tree inventories provided by West Coast Arborists and Orange County Parks ensures that we reach the “indicator” species (host species thought to be preferred by the beetle). The coordinates of each inspected tree are recorded on GPS devices, which have proven to be an efficient data management tool. We record the tree species and mark each tree as either PSHB-positive or PSHB-negative. We then assign PSHB-positive trees an infestation level of low, moderate, or heavy, based on the number of entry/exit holes on the trunk and branches and whether or not dieback is observed. Wood samples are taken from a handful of PSHB-positive trees when the beetle is discovered at a new location. These samples are sent to UCR and screened for Fusarium by Dr. Eskalen’s laboratory. Once lab-verified, the coordinates of PSHB-positive trees are uploaded to the Orange County Parks/West Coast Arborist tree inventory. PSHB is a new pest in Southern California, and many questions about its management and the regulatory impact on nursery shipments still need answers. However, collaboration between UCR (Dr. Tim Paine, Dr. Eskalen and Dr. Richard Stouthamer), UC Cooperative Extension, Orange County (John Kabashima), Orange County Parks, and West Coast Arborists has allowed us to share what resources and information we do have. We encourage all growers and land managers to alert us regarding any potential sightings of PSHB and to be vigilant, as always, about the movement of firewood. For more information about this pest, check out the website information listed in the resources below. Arakelian G. 2012. Polyphagous shot hole borer (Euwallacea sp.) vectoring Fusarium dieback (Fusarium sp.). County of Los Angeles, Dept. of Agricultural Commissioner/ Weights and Measures. http://acwm.lacounty.gov/pdf/Polyshotholeborer.pdf. Eskalen A, Stouthamer R. 2012. New beetle, fungus disease complex threatens avocado production. From The Grove 2(2): 3. http://www.californiaavocadogrowers.com/sites/default/files/2012-Summer-From-the-Grove.pdf. Eskalen A. 2014. Fusarium Dieback / Polyphagous Shot Hole Borer. http://eskalenlab.ucr.edu/avocado.html. Eskalen A. 2014. Polyphagous Shot Hole Borer (Euwallacea sp.) and Fusarium Dieback (Fusarium sp.). Center for Invasive Species Research, University of California, Riverside. http://cisr.ucr.edu/polyphagous_shot_hole_borer.html. Stouthamer R, Rugman-Jones P, Eskalen A, Gonzalez A., Arakelian G, Hodel D, Drill S. 2014.Polyphagous Shot Hole Borer. 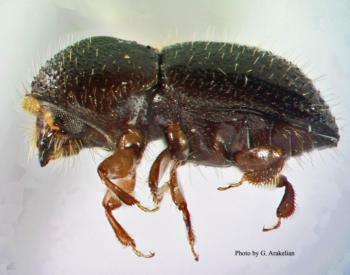 http://ucanr.edu/sites/socaloakpests/Polyphagous_Shot_Hole_Borer/. Western Plant Diagnostic Network. 2012. Polyphagous shot hole borer vectors Fusarium disease in California.  WPDN First Detector News 5(2):6-7. http://www.wpdn.org/webfm_send/254. John Kabashima is Environmental Horticulture Advisor and Monica Dimson is Staff Research Associate, UC Cooperative Extension Orange County.